The question isn’t so much, “How can we save money and still get an affordable zero energy home, but “where” can we save money?” Since we start building with a foundation, then it’s logical that the cost of a foundation is a good first place to start looking for places to save money. This blog will focus on the many details and considerations we encounter when building a zero energy home on a slab. This is referred to as a “slab-on-grade” house and it is the least expensive way to install a foundation for a new home in the cold climates of New England where we have to pour our foundations to a depth below frost, which is around four feet below grade. Of course, there is the obvious fact that in New England culture, we are accustomed to having unfinished basements in our new affordable zero energy homes and “us natives” find it difficult to imagine living in a home without one. But that is changing. 1. If I don’t need a full basement, then why spend the money on it? 2. 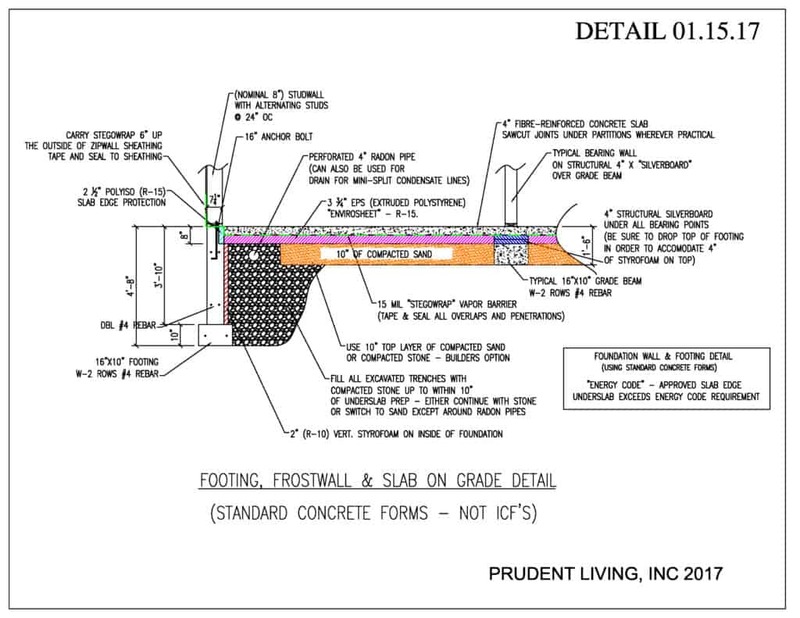 How much will I save if I build a 26’x36’ high performance house on a slab instead of on a full ICF basement, using our standard poured foundation detail?Answer: About $6,500.00. 3. I understand that I need frost walls for my house, but do I really need frost walls for an attached garage? Can’t I just pour an Alaskan Slab? Answer: We don’t recommend it, with one exception. If you are one of the lucky one in a thousand people who are building on pure sand or gravel, then you don’t need to worry about it. Go right ahead, but if you don’t know the answer, then it’s wise to consult with someone who is an expert on gravel. If I choose to build a two-story house on a slab……. 1. Will it negatively affect the resale value? Answer: It won’t affect the resale value so much as it might limit the market to those who don’t mind not having a full basement. 2. Will the slab “ice up” around the inside edges of the house? Answer: Not if you use our slab and frost wall insulation detail. 3. Will it be cold to walk or sit on? 4. Will it sweat on hot humid days? 5. Can I install hardwood floors on a slab? Answer: Yes. Any type of hardwood can be installed directly slabs, especially insulated ones. Just be sure to carefully follow the installation instructions. 6. Where will I install my utilities? Answer: We are finding that the second floor becomes a great place to install hot water heaters and a furnace; if one is required. Answer: Ironically, most people don’t consider that access to upstairs storage is no different from access to basement storage. Either way, you must use a set of stairs. However, upstairs storage does have one great advantage over a cool or unconditioned basement and that is that it is a much drier climate upstairs than it would be in an unconditioned basement.